I have a Jewish friend who asked for a hat for Hanukkah. I had started on a very pretty tweed-looking hat when he texted me and asked if I could put Diesel in his hat — Diesel being his 100 lb. black dog. It took me a while to figure out how I might do it. I ended up deciding on making a basic hat pattern but then I took a pattern for a dishcloth with a dog on it because I couldn’t find a dog hat. Instead of doing the knitting and purling it called for, I changed between the two colors. Here’s a picture of the hat. I think it’s a great pattern for a dog lover. 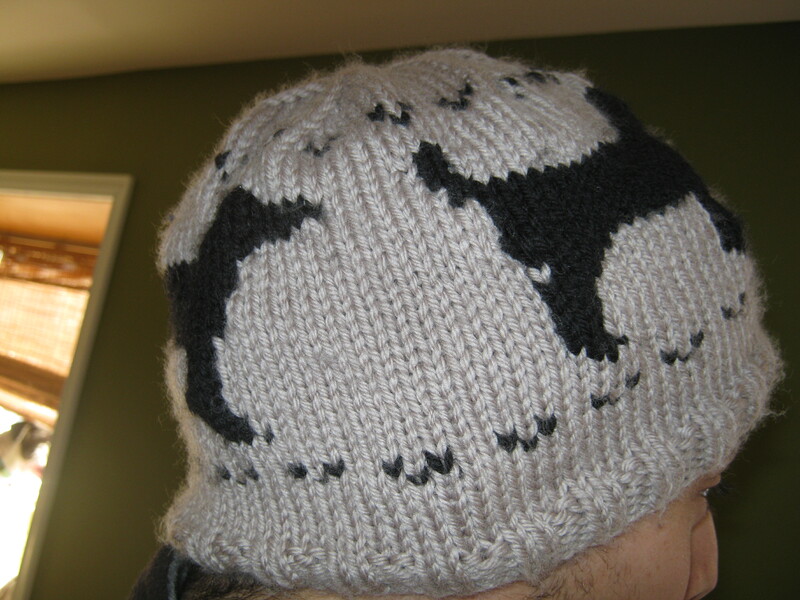 Plus, there aren’t any dog hat patterns that I could find anywhere. Please give me some input as I took pretty careful notes as I was knitting and should be able to manage a pattern out of it!